CW1 mortar stain remover has been specially formulated to remove excess mortar stains , cement splashes, and efflorescent etc. from stone, brick, patios, glass, concrete ,tiles, etc. CW1 can also be used for descaling mixers, plant and machinery etc. Apply CW1 evenly using a plastic watering can, spray or bristle brush. Allow approx. ten minutes contact time and wash off with cold water power washer at minimum 1000 PSI. Product must be diluted before applying to most types of stone & brickwork . NB. On coloured mortar/ concrete patio flags , use well diluted as the colour will run with some types. ALWAYS TRY A SMALL SAMPLE AREA FIRST. Use at full strength as supplied for descaling mixers, plant and machinery. NB. Mask polished surfaces, copper, bronze, aluminium, etc. Stainless steel – is a generic name given to steel containing a minimum 10.5% chromium. It is not a single material , there are many different grades and qualities. The cheapest ‘ ferritic ’ grade is the type most commonly used for decorative building features, i.e. balustrades, signs, trims, frames panels etc. It is not very resistant to acid. 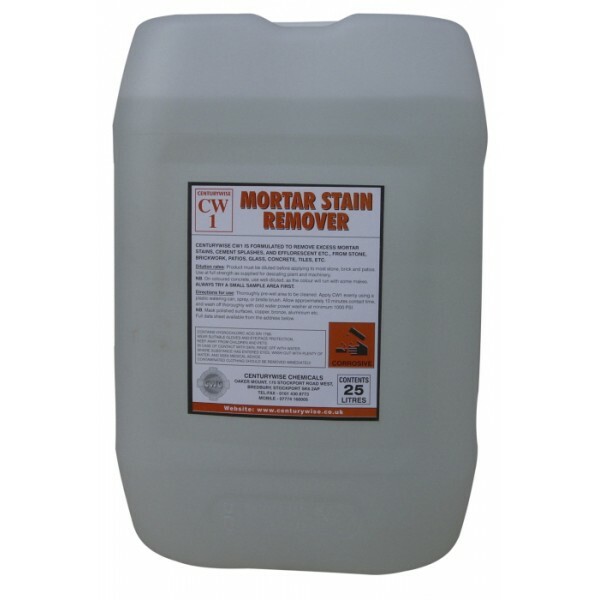 Hydrochloric acid will remove the passive layer and cause surface staining and corrosion pits. Some expensive, high quality grade stainless steels are extremely resistant to acid but it is always best to assume the worst case and ….. MASK ALL STAINLESS STEEL FEATURES.